Oh Norma. Not only does she know she never should have gone into the Demi-Monde, now she’s not sure she can get out. And to make matters worse, her “savior” seems to have developed an alternate personality — one that’s not really friendly, or very interested in saving Norma’s hide. So what’s a girl to do?Save herself, that’s what. And if that means turning into a revolutionary, then Vive la révolution! 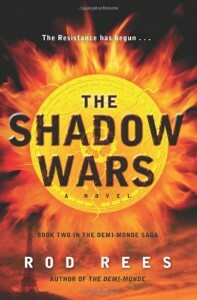 Fitting, as she’s now in the Quartier Chaud, wondering what Aaliz Heydrich is doing with her life in the real world.The Shadow Wars is as cheeky (and mayhap as offensive too) as The Demi-Monde, and sometimes even more so. We spend time with a few more characters, learn a little bit more of the politics, and find out that there’s nefarious purposes afoot — that’s planned, not the surprise that is Ella Thomas… I quite enjoyed it, and am looking forward to the next installment, to see where Norma goes with her new role, and (hopefully!) how it all shakes out.drey’s rating: Excellent!